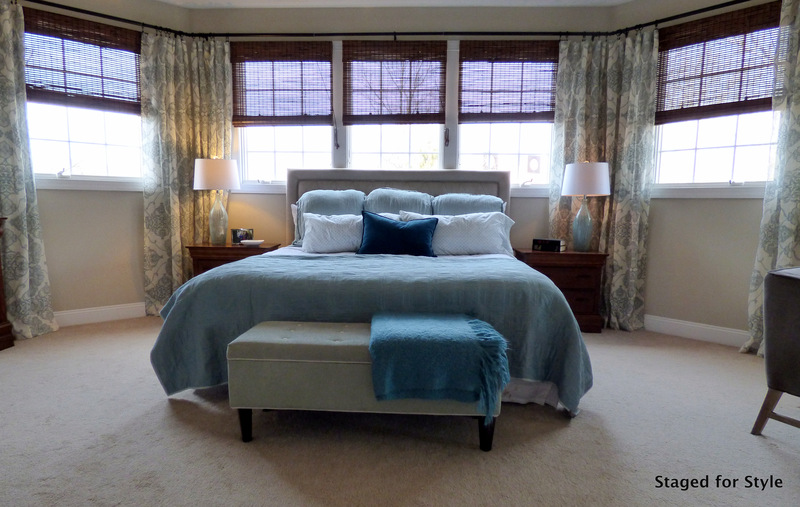 We recently wrapped up a master suite project for some wonderful clients. 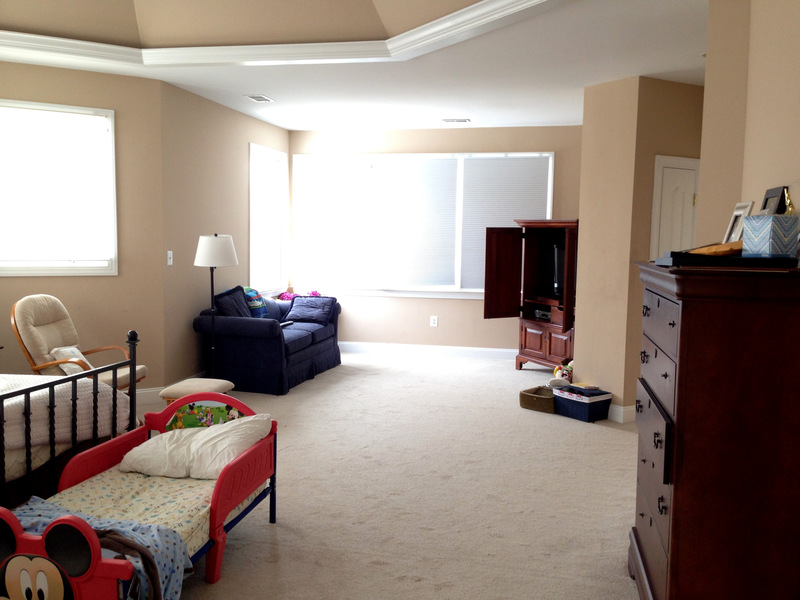 They have a large and very busy family and were in need a of an updated and welcoming master suite where mom and dad could have a little down time at the end of the day. This couple was so wise to spend their time and decorating dollars on this often neglected part of the home. One of the great things about this project was that the bedroom and attached sitting room were pretty much a blank canvas. The suite is very spacious and gets an amazing amount of natural light from the many windows in the space. 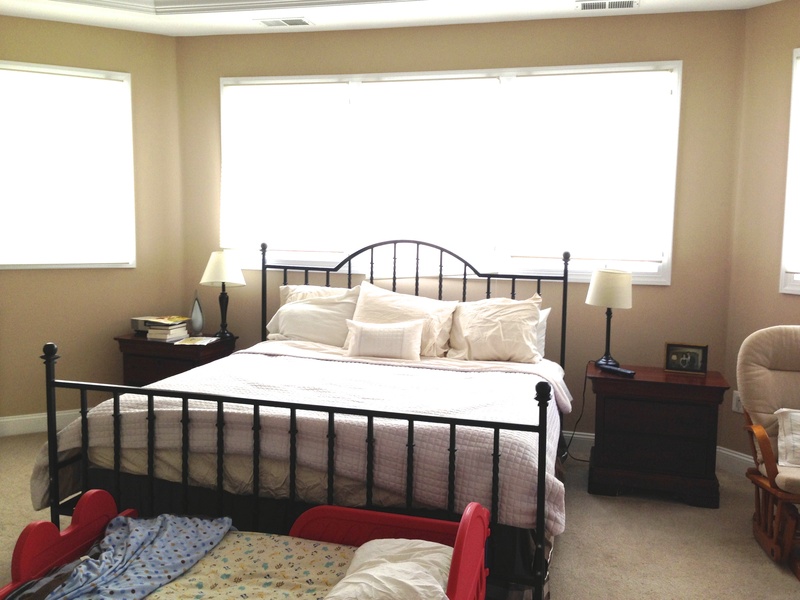 We knew it could be transformed into a beautiful bedroom for this busy couple. Our goal: A cophisticated space that was fabulous to wake up to and a welcoming retreat at the end of the day. Cozy + Sophisticated = Cophisticated. We started with paint. The walls were beige, however, the color was a bit peachy for the overall look we wanted to achieve. All beiges are NOT created equal as you might remember from this post. Freshly painted with Sherwin Williams “Accessible Beige” these walls became a perfect backdrop for the rest of the elements in the space. The placement of the bed in this room needed to be in front of the windows. This meant that the windows needed to serve as a “frame” for the bed. 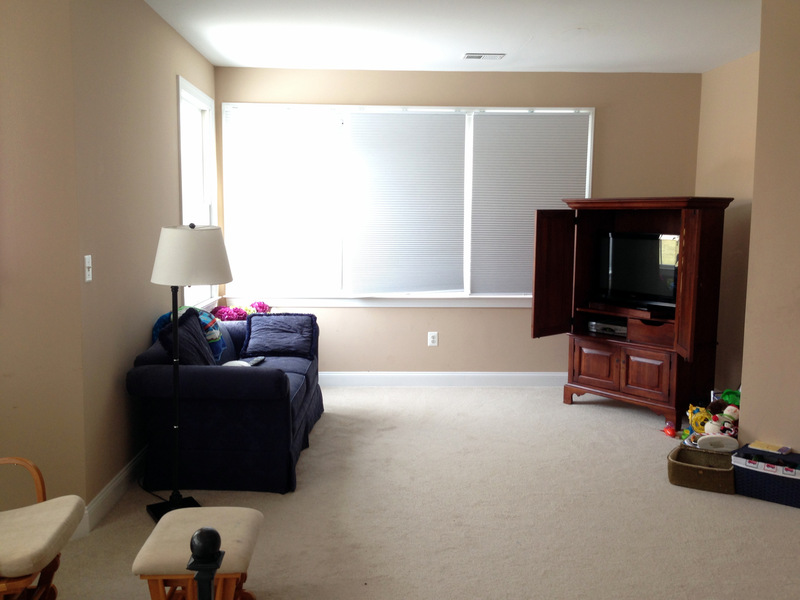 We decided to go with bamboo roman shades accented by some light and lovely sheer panels. A new tufted linen headboard, updated bedding and a pair of gorgeous glass lamps finished this area beautifully. 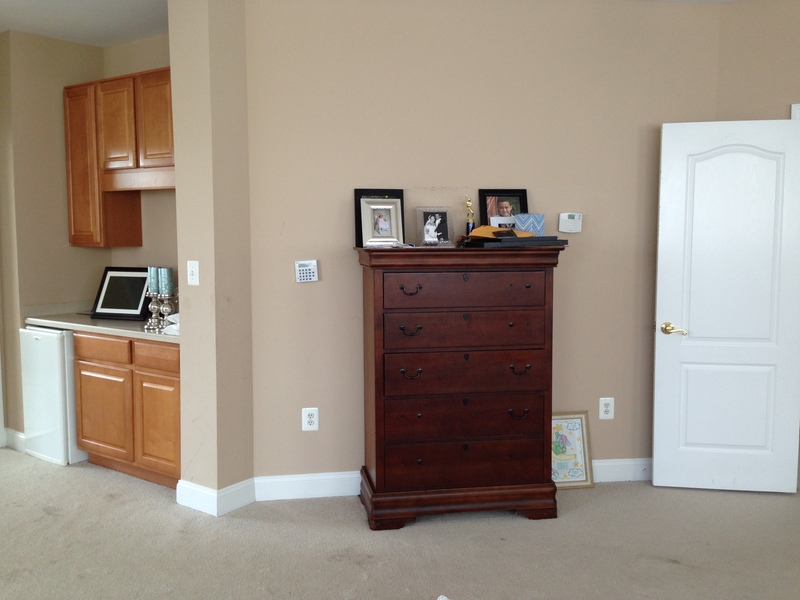 We were thrilled to be able to use the client’s existing dresser and nightstands. 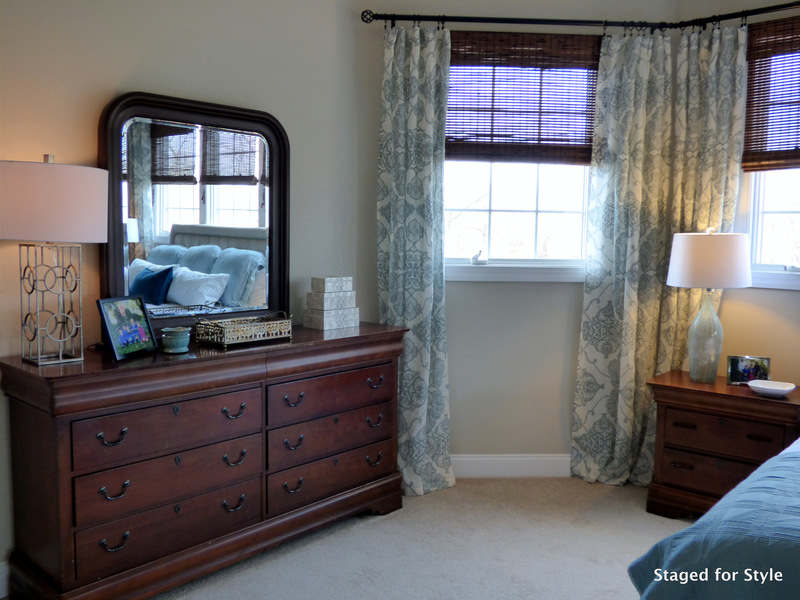 The dresser just needed a lamp and a little accessorizing to be just as lovely as the rest of the room. Across from the bed there was a tall chest that looked a little lost and forlorn and wasn’t needed for storage. So we swapped it out for a great little sitting area with some soothing artwork. Much better to wake up to! 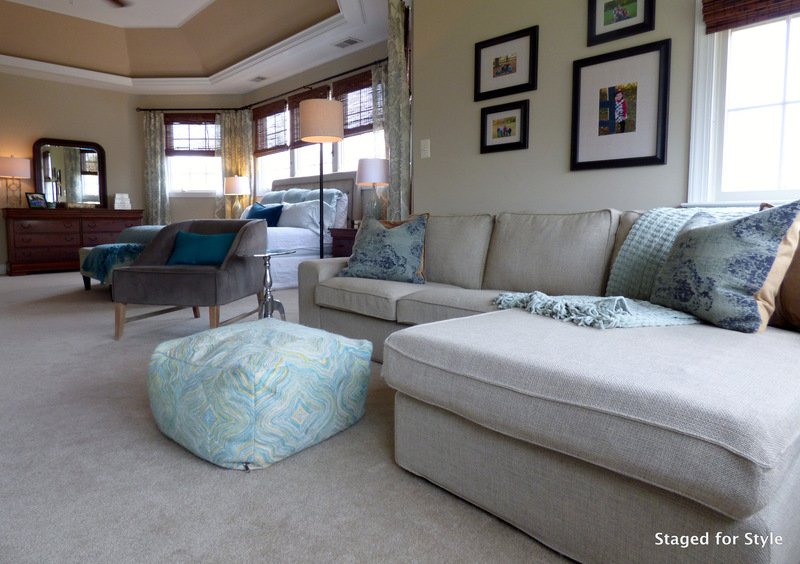 The sitting room often serves as a pre-bedime TV watching/family hangout area, so it needed to stylish, comfortable and provide as much seating as possible for the family. 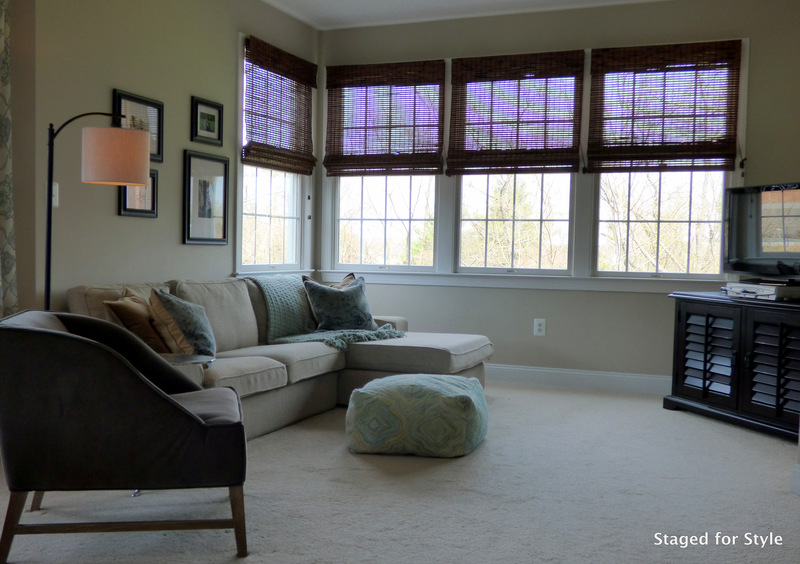 A new chaise sofa and comfortable suede chair provide seating and the windows are up-to-date with bamboo roman shades. These plus a new media cabinet with storage underneath all came together to give the sitting room a much more updated and cophisticated look and feel. 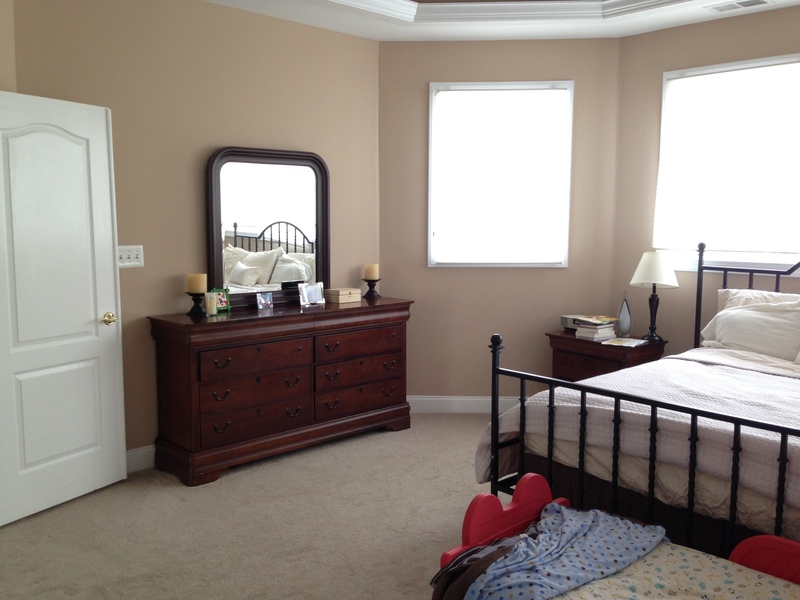 We were thrilled with how this master suite was transformed from ‘blah’ to ‘ahhhh’! Often the master bedroom is the last to get decorating attention as we are very often focused on the more public rooms of the house, which is understandable. However, at the core of every family is at least one parent, usually busy and often exhausted, who needs their own place to relax and renew at the end of each day. A master bedroom that makes you smile and invites you in and restores you. Does your bedroom welcome you in and make you smile or is it all piles of laundry and blank walls? Think about how it might be made more of a sanctuary and less of an afterthought. Just because you are the only one who sees it doesn’t make it any less important. Give it the attention it deserves and it will give you back the rest and renewal you deserve. What a lovely update! Where did you find the chaise sofa? That’s a WOW! You are really talented!!! When are you going to have your own TV show? 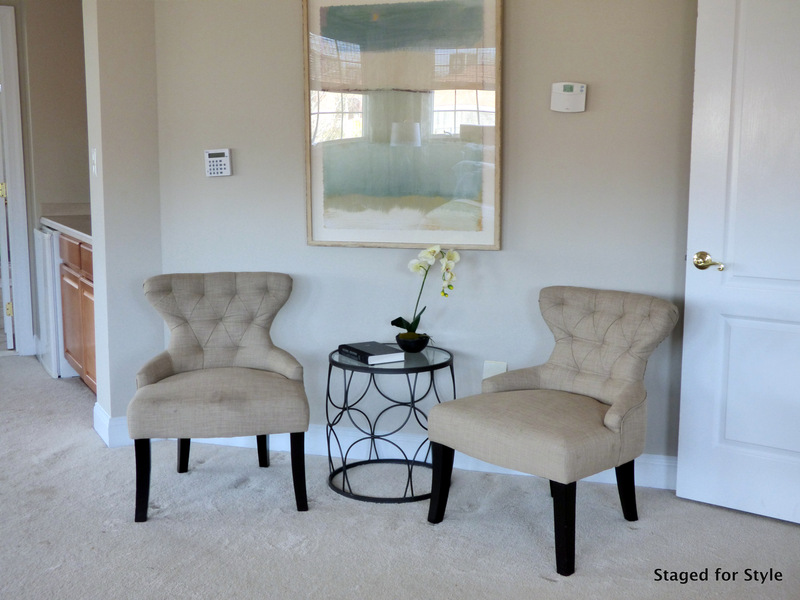 So great seeing another creation by Staged for Style!!! Love everything about this master re-do! Gorgeous! A very serene suite.